Lightly brush the bottom of the flatbread crust with olive oil. Spread the goat cheese on top of the flatbread crust. Sprinkle the crumbled bacon and fig pieces over the goat cheese. Drizzle 1 tbsp. 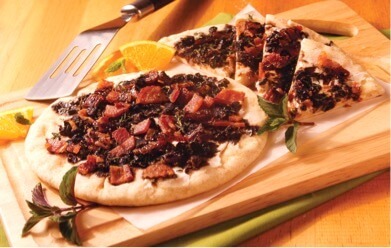 of the reduced balsamic vinegar over the top of the bacon & figs. Heat the flatbread in the oven at 375 degrees for 6-7 minutes. Sprinkle the fresh thyme over the flatbread before serving. Place these items in a small sauce pan and cook on medium heat until the mixture is reduced to a syrup consistency.